Nandita Das wears many hats and her fiery passion to make a difference is evident in the choices she has made in her life and work. She is known to never shy away from controversial issues and unconventional roles and has chosen to be part of stories that she feels need to be told. She has acted in over 30 feature films in ten different languages with many eminent directors like Mrinal Sen, Adoor Gopalakrishnan, Shyam Benegal, Deepa Mehta, Mani Ratnam and others. Firaaq, her directorial debut feature film premiered at the Toronto Film Festival in 2008, and has traveled to over 50 festivals, winning over 20 awards and much appreciation from audiences and critics. She has been on the jury of Cannes Film Festival twice (2005 and 2013), among others. The French Government conferred her with the Knight of the Order of Arts and Letters (Chevalier dans l'Ordre des Arts et des Lettres), their prestigious civilian award. In 2011 Nandita Das was the first Indian to be inducted into the Hall of Fame of the International Women’s Forum. Nandita did her Masters in Social Work from University of Delhi and worked with various NGOs, before she made forays into films. She continues to advocate issues of social justice, especially those of women, children and the marginalised communities, through various platforms. She has been a featured speaker at many reputed universities and social forums, both in India and abroad. She writes a monthly column called the Last Word, for the magazine, The Week. She was the Chairperson of the Children’s Film Society, India, where she made many big and small changes to revamp the organization. Nandita has written, directed and acted in the play, Between the Lines that deals with gender inequalities. The play has garnered a lot of praise from both, critics and audiences and has been traveling to many cities across the country. Nandita Das is a Yale World Fellow 2014. She was among the 16 emerging global leaders who were chosen from close to 4000 applicants. The mission of the fellowship is to cultivate and empower a network of globally engaged leaders committed to positive change through dialogue and action. Nandita Das wears many hats and her fiery passion to make a difference is evident in the choices she has made, both professionally and personally. She has acted in over 40 feature films in 10 Indian languages, and in three professional plays. She directed her debut feature, Firaaq, in 2008 that won her much appreciation and accolades in India and abroad. After her Masters in Social Work, she continues to advocate issues of social justice and human rights. Between the Lines marks her debut as a playwright and theatre director. She writes a monthly column called the Last Word, for a national weekly. She was the Chairperson of the Children’s Film Society, India, where she made many big and small changes to revamp the organization. She was on the jury of Cannes Film Festival twice (2005 and 2013). The French Government conferred her with the Knight of the Order of Arts and Letters (Chevalier dans l'Ordre des Arts et des Lettres), their prestigious civilian award. 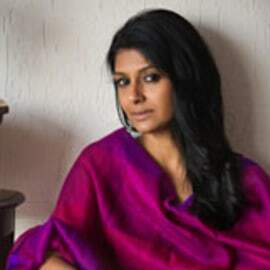 In 2011 Nandita Das was the first Indian to be inducted into the Hall of Fame of the International Women’s Forum. Nandita is a Yale World Fellow 2014, among 16 other emerging global leaders who were chosen from close to 4000 applicants. The mission of the fellowship is to cultivate and empower a network of globally engaged leaders committed to positive change through dialogue and action.